Friends Board of Directors Member Dr. Jonathan Spector and his wife Marci Spector will host an event on Nov. 29 at the Harvard Faculty Club in Cambridge, Mass. 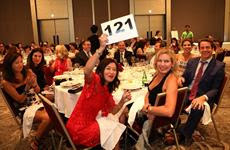 The popular Friends Photo Auction is back! More than 100 prints wil be auctioned on Wednesday, Dec. 12, at The Highline Loft in Manhattan. If you cannot attend, you can start to bid on the prints two weeks before the event via Artsy. Read about the newly expanded unit here. 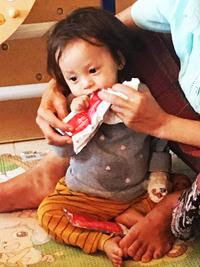 Recognizing the high incidence of malnutrition in Lao PDR, administrators at LFHC are initiating a malnutrition care program that they hope will dramatically reduce the need to hospitalize children for long periods to treat the condition. LFHC doctors and nutritionists have begun to treat malnourished children with eeZeePaste, a ready-to-eat therapeutic food that has been endorsed by UNICEF. The product contains a mixture of peanuts, milk powder, oil and vitamins – everything a child needs to recover from malnutrition. 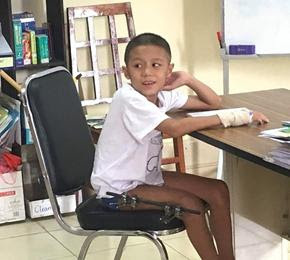 It took some time for Aiy to become accustomed to the external fixation, which he would need for several months. 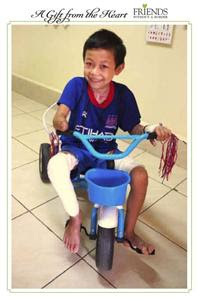 He still cannot walk, but he moves around the hospital in a wheelchair with the help of his father. 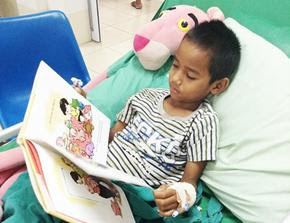 While he recovers at the LFHC, the hospital’s nutrition team has been addressing his malnutrition to ensure that he continues to improve. Thanks to everyone who made the Lao Friends Second Annual Gala Dinner a huge success. The fundraiser was held on October 19 in Luang Prabang. Honorees for Best Friends of Friends Award were Henrik Juel Andersen, managing director of the Lao Brewery Company, and Dr. Somchittana Soulalay, senior pediatrician and assistant medical education director at LFHC. 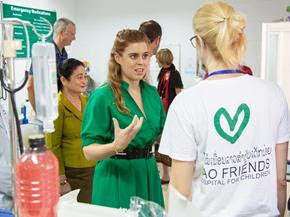 Her Royal Highness Princess Beatrice of York attended the gala and addressed the attendees. More photos may be seen here. This year’s Run for the Children Luang Prabang Half Marathon attracted throngs of runners from around the world, including a member of Britain’s Royal Family. Her Royal Majesty Princess Beatrice of York donned her running shoes for the race. The princess is no stranger to long-distance running. She was the first royal to complete the London Marathon in 2010. Photos of the event may be seen here. Race results may be seen here. A special thanks to the event committee members for organizing such an incredible event! A grateful Friends Founder Kenro Izu noted that the proceeds from the event are equivalent to the cost of providing free medical care to more than 1,500 children. 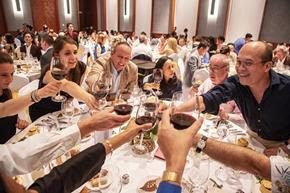 He added that the event also exceeded its Neonates Fund-A-Lifeline goal by raising ¥5.8 million ($51,870 U.S.), which would cover the hospitalization costs of 167 babies. Friends Without A Border is extremely grateful to the supporters who made the Second Annual Hong Kong Gala a wonderful success. The event raised more than $65,000. Thei theme of the gala was “The Magic of Caring” and the event featured prestidigitation by a strolling magician. 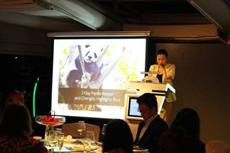 The event was held on Oct. 25 at the Renaissance Hong Kong Harbour View Hotel. Photos of the gala may be seen here. We’ve attained 30.1 percent of the goal in our GoFundMe campaign to raise money to purchase medicine for Lao Friends Hospital for Children. This warms our collective heart. Many thanks, donors! However, we would like to push forward toward our goal. Please help. If you cannot make a contribution (or have already made a donation), please spread the word. Tell your family and friends. Post a link to our GoFundMe campaign on your Facebook page and your Instagram page. Tweet about it. We are looking for a few Friends to help us on Gving Tuesday by creating fundraising pages on their social media sites for Friends Without A Border. Creating such a page on Facebook or CrowdRise is actually quite easy. As you know, Giving Tuesday, the first Tuesday after Thanksgiving (here in the U.S.) is an international day of charitable giving. For additional information, please send an email to our manager of communications, Gary Kane, at gary@fwab.org. We’re guessing that you haven’t finished your holiday shopping yet. Haven’t even begun? Consider sending your family, friends and work colleagues a holiday gift that tells them you’ve made a donation in their name fo Friends Without A Border. Please click on this link to learn more about this offer.